Home » SLIDES » Spring into Wellness Challenge Starts April 1! 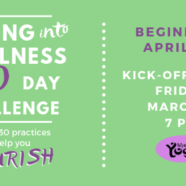 Spring into Wellness Challenge Starts April 1! Join us for our kick-off event on Friday, March 29! More info on our Facebook page.